Google Earth Engine filterdate ignored by plot? I'm starting with Earth Engine (EE) coding. Following instructions from https://developers.google.com/earth-engine/tutorial_api_07 I was able to put together some code and get a plot. But why the range of date on the plot goes from 2016 to 2018 while filterDate('2017-01-01', '2017-12-31')? That is because in line 18 you call s2, which is likely your whole input image collection of the sentinel-2 (but you'll have to provide a link to your code to see those input features). Besides, you are trying to filter an image on date and location, which is not possible. You can only do that for image collections. By getting the first() of an image collection, you will only get one image. Using globe view in Google Earth Engine? 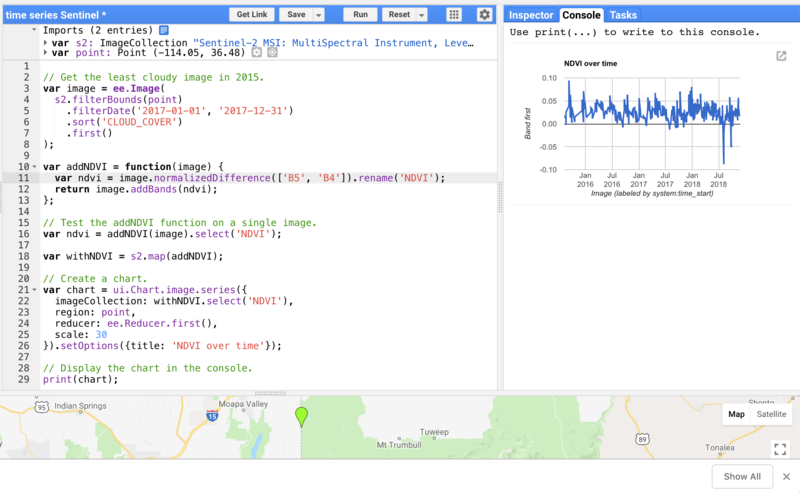 How to interpret the red trend map of time series on Google Earth Engine?